How to Easily Master Format SAMSUNG GALAXY J1 MINI PRIME / GALAXY V2 with Safety Hard Reset? Tips and tricks to fix SAMSUNG GALAXY V2 / GALAXY J1 MINI PRIME problems. This phone comes with smaller screen size at 4 inches LCD screen. The internal memory of SAMSUNG GALAXY J1 MINI PRIME / GALAXY V2 is 8 GB with 1 GB RAM, this good enough for starter smartphone, because previously for starter Samsung smartphone use 4 GB storage. If we need more storage for keep music or downloaded files or movie, then we can expand with external memory card maximum 256 GB. How to Fix or Problem Solving for Recovery SAMSUNG GALAXY J1 MINI PRIME / J106F / J106B / J106H / V2 hang or not responding or malfunctions or stuck or freezing or bricked ? This phone use for entry level users, therefore it have limited storage and RAM. SAMSUNG GALAXY J1 MINI PRIME / J106F / J106B / J106H / V2 have 8 GB internal memory and we will not get totally 8 GB free, because some of them use for operating system and other installed applications. However, we still have some free storage to install some interesting applications, but please only choose important one like Facebook, Instagram, Whatsapp, Snapchat, Line Messenger, WeChat, Viber, Skype, Blackberry Messenger (BBM), Telegram. Some applications inside Google Play Store may contain viruses or malware, therefore we always need to read as many user review as possible before download especially new applications. If we downloaded that kind of apps then our SAMSUNG GALAXY J1 MINI PRIME / J106F / J106B / J106H / V2 can become stuck or hang or bricks or frozen or bootloop or LCD touch screen not responding or not responsive with our finger touch. What should we do when our phone get this problems? First steps, we have to try do soft reset or reboot for clean temporary files and caches. After SAMSUNG GALAXY J1 MINI PRIME / J106F / J106B / J106H / V2 can start or boot again, we can try to give good antivirus which are free from Google Play Store like AVAST or NORTON. If the problems still happen, then we have to do hard reset or master format. Please note, doing hard reset will remove or erase all important data, therefore we have to backup all data first before doing master format. Doing hard reset will remove all Google account from SAMSUNG GALAXY J1 MINI PRIME / J106F / J106B / J106H / V2. How to Force Shutdown or Force Soft Reset or Reboot or Restart SAMSUNG GALAXY J1 MINI PRIME / J106F / J106B / J106H / V2? As far as we install important and recommended apps, then our phone will not get trouble, but if some trouble happen with bad applications, then this phone will become strange or hang or LCD touch screen stuck. We can try to repair this trouble by doing reboot or soft reset or restart to clean temporary files, caches and restart all running applications inside this smartphone. Please press and hold POWER button until SAMSUNG GALAXY J1 MINI PRIME / J106F / J106B / J106H / V2 shutdown or turn off by itself. This process will not remove any important data, therefore we can do this process anytime we want. If our SAMSUNG GALAXY J1 MINI PRIME / J106F / J106B / J106H / V2 still can work without problems, but we want to clear temporary files and caches, then please press and hold POWER button until pop-up menu appear, continue choose Shutdown / Power off / Reboot menu. How to backup data or Contact at SAMSUNG GALAXY J1 MINI PRIME / J106F / J106B / J106H / V2 ? We can use microSD external card to copy or move important files using File Manager applications. If our SAMSUNG GALAXY J1 MINI PRIME / J106F / J106B / J106H / V2 has already signed in with Google account, by default our contact will be synchronize in the background to Google server. Please make sure we check all contact at Google contact server using Internet browse to make sure backup is done. If we see the menu at LCD screen, choose Wipe Data/Factory Reset with Volume Button to select and use Power Button to ok or enter. The SAMSUNG GALAXY J1 MINI PRIME / GALAXY V2 will doing the process of restoring to factory default. How to Restore and Reinstall Clean Android Operating system / firmware at SAMSUNG GALAXY J1 MINI PRIME / J106F / J106B / J106H / V2 (Reformat) ? There are two kind of Android operating system which ship with this phone. Because this phone have 3G Only version and 4G LTE version. The 3G Only version comes with Android Lollipop and 4G version comes with Android Marshmallow. All operating system have installed inside this phone. But some installed applications may crash and make SAMSUNG GALAXY J1 MINI PRIME / J106F / J106B / J106H / V2 operating system become corrupted or damaged. If we get this conditions, we have to reinstall with clean operating system. How to do that? Please note, the clean factory default Android operating system file source already saved safely inside SAMSUNG GALAXY J1 MINI PRIME / J106F / J106B / J106H / V2 ROM or internal memory, therefore we do not need to download or copy from other sources. Just do simple steps to hard reset above, then clean factory default Android operating system will be reinstall automatically. How to Unlock or Fix or Bypass or Solutions for SAMSUNG GALAXY J1 MINI PRIME / J106F / J106B / J106H / V2 forgot password code or security lock screen pattern or pin (lost password)? Although this phone have only 5 MP main camera and VGA front camera for selfie photography, but we still need to secure all important pictures or data inside memory to make sure unauthorized users can not read our files when SAMSUNG GALAXY J1 MINI PRIME / J106F / J106B / J106H / V2 away from us or stolen or lost. We can give security protections like pin password or pattern. The problems will happen when we forgot security protections answer, what should we do? Do not worry because we can unlock or bypass forgotten screen lock pattern or password pin protections at SAMSUNG GALAXY J1 MINI PRIME / J106F / J106B / J106H / V2 by using Google account. Please turn ON this phone, when security protections ask for unlock answer then try to give several time wrong answer continuously until our SAMSUNG GALAXY J1 MINI PRIME / J106F / J106B / J106H / V2 locked or freezing 30 seconds, at this time we can find Forgot Password / Pattern button. Press this button, then we can find field to type our Gmail username and password that we have already signed-in before. If we can not access our Gmail account, then we have to do hard reset using hardware button combination key. What is BACKUP PASSWORD / BACKUP PIN at SAMSUNG GALAXY J1 MINI PRIME / J106F / J106B / J106H / V2 ? This is the way to help for unlock or bypass forgotten security protection at SAMSUNG GALAXY J1 MINI PRIME / J106F / J106B / J106H / V2. Although we are sure about our security protection, but sometime we may forget about the right answer. Please note, when we give security protection at our SAMSUNG GALAXY J1 MINI PRIME / J106F / J106B / J106H / V2, it also give step to put our own PIN / PASSWORD as BACKUP PASSWORD / PIN. This backup PIN use to bypass or unlock forgotten security code later. Use above steps to unlock forgot password or screen lock pattern security protection using Google account or Gmail username and password. How to Improve Performance SAMSUNG GALAXY J1 MINI PRIME / J106F / J106B / J106H / V2 to make run more faster? This phone have some limited capabilities to run many applications together, the processor to run all process use Spreadtrum SC9830 and dedicated GPU (graphic processor unit) Mali-400MP2. Not all 3D HD Games can be play inside this phone. For standard applications will run without problems but some users get slowly problems at SAMSUNG GALAXY J1 MINI PRIME / J106F / J106B / J106H / V2? Usually because applications trouble. We have to know that some applications will keep run in the background to wait data update like social media or games or chatting applications, they will consume RAM to standby. Especially this phone have limited 1 GB RAM for multitasking. Therefore some users may get slowly trouble at SAMSUNG GALAXY J1 MINI PRIME / J106F / J106B / J106H / V2 because insufficient RAM and processor resources. We have to uninstall some not use applications. If we want to make our SAMSUNG GALAXY J1 MINI PRIME / J106F / J106B / J106H / V2 run faster again like new, then please consider to do hard reset or master format. Is That Any Secret Code to Format SAMSUNG GALAXY J1 MINI PRIME / J106F / J106B / J106H / V2 ? There is no secret hidden code for SAMSUNG GALAXY J1 MINI PRIME / J106F / J106B / J106H / V2 to make it back to factory default. Do the options above to hard reset it. How to Upgrade SAMSUNG GALAXY J1 MINI PRIME / J106F / J106B / J106H / V2 to Android Nougat Update? When the first time release in the market, this phone use Android Lollipop and Android Nougat. At the time we make this information, we still not get any news about how to upgrade SAMSUNG GALAXY J1 MINI PRIME / J106F / J106B / J106H / V2 with Android Nougat. However, we still get some firmware minor update to fix some bugs and improve performance. Maybe there are some custom ROM from other community, but please be careful to use not standard operating system. We strongly suggest to use official Android operating system. We do not recommended to install not official firmware or operating system (custom ROM) or root SAMSUNG GALAXY J1 MINI PRIME / J106F / J106B / J106H / V2, because some custom ROM can make some features can not run properly. How to Format or Erase Phone Memory at SAMSUNG GALAXY J1 MINI PRIME / J106F / J106B / J106H / V2 ? There are two phone memory type at SAMSUNG GALAXY J1 MINI PRIME / J106F / J106B / J106H / V2, one is internal memory and the other one is external memory. If we want to format internal memory phone then we have to do hard reset or reformat the operating system of SAMSUNG GALAXY J1 MINI PRIME / J106F / J106B / J106H / V2 as well. Please use menu setting to do hard reset or reformat using #option 1 above, but make sure to give checkbox mark at Erase Internal SD card / Internal storage. Then it will reformat the factory default operating system and remove or erase any data inside internal memory. To reformat or wipe or erase all data at external memory, we can use menu Setting > Storage > Erase Internal Storage / SD Card. Please always make sure all data has already backup before reformat or wipe everything, because it is hard to recover formatted / wiped data at internal or external storage. How to Make Battery of SAMSUNG GALAXY J1 MINI PRIME / GALAXY V2 Stronger, Life Longer and Not Fast to Drain ? How strong SAMSUNG GALAXY J1 MINI PRIME / GALAXY V2 battery can work? At 4 inches LCD screen width, the standard battery of SAMSUNG GALAXY J1 MINI PRIME / GALAXY V2 use 2600 mAh battery capacity. This is good enough to make this phone can work for full one day without recharge. But if we use this phone more longer like watch full movie or playing games for several hours, then we suggest to do some adjustment. First we can set LCD screen brightness as low as possible to reduce battery usage. The second steps that we have to do is disable all not use connections like GPS or Bluetooth or Wifi. We can turn it on anytime we want, because they will consume battery capacity although we do not use that connections. If some applications need to use GPS to know our location, then please use GPS battery saving mode from menu Setting > Location. 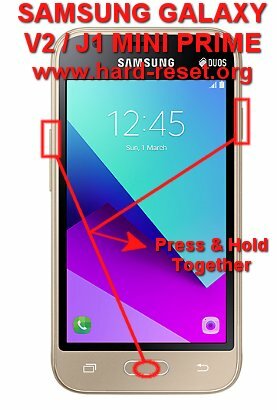 The information from this page describe about cara reset samsung j1 mini prime,samsung j1 mini prime google account bypass,samsung j1 mini prime factory reset,J106f format,j1 mini problems,j1 mini prime bypass google account,how to bypass samsung j1 mini,how to bypass Google email after restore farmat j1 Samsung,how to bypass google account on samsung j1 mini with pc,how can i unlock my samsung galaxy J1 mini prime phone?. If you need another resource for hard reset, use search function at this homepage or find from our related posts. How to Easily Master Format SAMSUNG GALAXY C9 PRO with Safety Hard Reset? How to Easily Master Format SONY XPERIA T2 ULTRA / T2 ULTRA DUAL (D5303 / D5306 / D5316 / XM50t / D5322 / XM50h) with Safety Hard Reset? How to Easily Master Format NOKIA 7 with Safety Hard Reset? How to Easily Master Format LG V35 THINQ (PLUS) with Safety Hard Reset? community on How to Easily Master Format LENOVO VIBE X2 with Safety Hard Reset? community on How to Easily Master Format SAMSUNG GALAXY S DUOS 2 S7582/S7580 with Safety Hard Reset?